BitComet 1.55 - BitTorrent adalah protokol yang membenarkan anda mendownload files yang besar dengan pantas menggunakan bandwith internet yang minima. File Torrent pula adalah file yang digunakan BitTorrent untuk mendownload file. Biasanya file torrent adalah berekstensi .torrent. 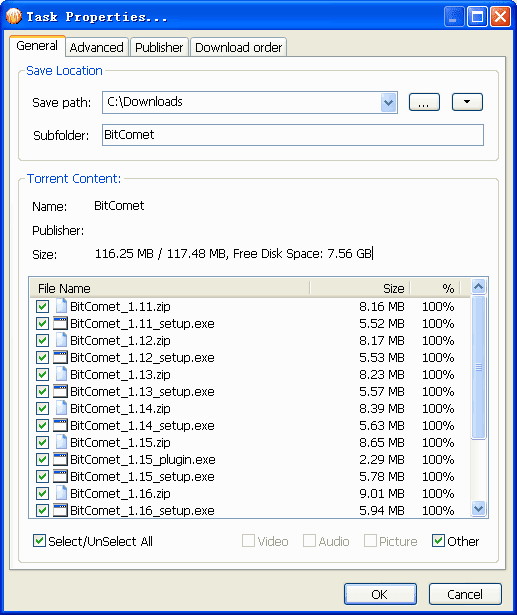 Untuk membuka file torrent dan seterusnya mendownload, anda perlukan applikasi khusus seperti BitComet. Ia merupakan klien download BitTorrent yang sangat berkuasa, pantas dan amat mudah digunakan yang mana ia menyokong banyak protokol bittorent moden seperti Magnet Link, HTTP Seeding, DHT Network, UDP tracker Protocol V2. Cross Protocol Downloading: Benefit from HTTP/FTP/eMule download sources while BitTorrent downloading. Auto Config ICF: (Internet Connection Firewall) and ICS (Internet Connection Sharing) in Windows. Auto Config UPNP: port mapping in router (UPnP support is required in router). Disabling or Setting Priority: of files in torrent: Files can be skipped for downloading, or set to higher / lower priority, allowing you to select which file finish first. Bittorrent Protocol: Also support Multi-tracker, DHT, utf-8 extension, and UDP tracker Protocol v2. Intelligent File Rename: Automatic choose the best name for your download file. Preview while Downloading: Preview of avi, rmvb, wmv and other video files is available during downloading process. Multi-Mirror download: Mirror servers are automatically found for the file being downloaded. Data from these servers are downloaded at the same time to increase download speed 300% or more. Add tags to task, categorize tasks on the fly. Bandwidth Scheduler and Automatic Shutdown.